Our 2017 Chevrolet Malibu 1LT Sedan is terrific in Silver Ice Metallic! Powered by a TurboCharged 1.5 Liter EcoTec 4 Cylinder that offers 163hp while connected to a 6 Speed Automatic transmission for smooth acceleration. This Front Wheel Drive combination provides proven the fuel-saving technology you demand and yields an incredible 37mpg on the open road. You'll want to go the extra mile in your Chevrolet Malibu 1LT that's eye-catching with its beautiful wheels, LED daytime running lights, and confident stance. Open the door to the thoughtfully crafted cabin with everything perfectly in place as if you had designed it yourself! Settle into the supportive power-adjustable driver seat and enjoy key-less start, the MyLink infotainment system touch screen, Android Auto/Apple CarPlay, available WiFi, Bluetooth, available satellite radio, and more!Your safety is paramount as demonstrated by advanced airbags, OnStar, a tire-pressure monitor, and stability/traction control. With a spacious interior, efficiency paired with performance, and incredible safety ratings, Malibu is the smart choice. 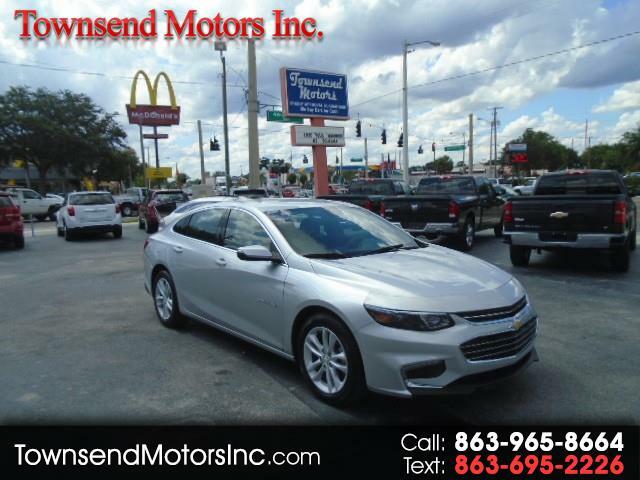 This is a well-rounded sedan that will meet all of your needs so...Print this page and call us Now... We Know You Will Enjoy Your Test Drive Towards Ownership!